Psi Bands (pronounced “Sigh Bands”) were created by two fashion-forward moms-to-be looking for a drug-free way to treat their ongoing morning sickness. Determined to feel better without using drugs, they discovered the benefits of wrist acupressure to relieve their nausea and vomiting. Acupressure uses pressure to stimulate the body’s natural self-curative abilities. Psi Bands are being praised for their unique combination of features and benefits. 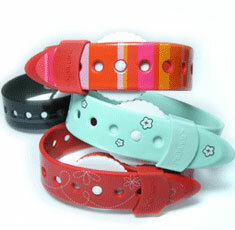 Purchase Psi Bands ® from our retail website, BabyHopes.com. Scientific studies support the use of wrist acupressure for the relief of nausea due to morning sickness, motion/travel sickness, chemotherapy, and anesthesia. Wrist acupressure has grown in popularity because it is noninvasive, easy to self-administer, and affordable. Psi Bands are adjustable at two areas, around the wrist and at the acupressure point. The wrist adjustment allows for different sized wrists. The acupressure point dial allows the wearer to “Dial It In” for personalized comfort.